I've tried different streaming devices over the years: Roku, Apple TV, Fire TV, Chromecast, and TiVo. They all have their good points and bad points. Any of them would be a good choice for streaming. One or another my be better or worse for any particular individual based on the where they want to get their streaming data from. For example, if someone is big into iTunes or has a lot of Apple devices, the Apple TV is probably the best option. If someone is totally immersed in Amazon, the Fire TV might be the best option. There's no one answer that's right for everybody. Recently, I added another streaming device to my collection: the Android TV player, Mi Box. It's a cheaper alternative to the Nvidia Shield, which is the Flavor of the Month for many of the Kool Kidz that stream. Personally, as intrigued as I might be by the Nvidia Shield, I'm not going to put out $180 just to test something. The $69 I shelled out for the Mi Box was the upper limit on that kind of silliness. So, just to be clear, I haven't used the Nvidia Shield. However, it and the Mi Box are both Android TV devices. The Google Play Store apps for one will work on the other. I know there are ways to side load content onto the Nvidia Shield, but I'm not interested in that. If you are, you can find videos on The YouTube. I'm not interested. I'm looking for stuff that anybody can go into a store or purchase online, take the device, and use. No jumping through hoops. Simple. That's my focus. 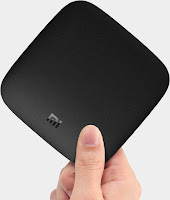 Anyway, my point there is what I'm writing about the Mi Box is mostly applicable to any Android TV device. What I like about the device is that it's easy to set up and use. It's very responsive. It supports 4K, though I don't have a 4K TV. It comes with some common popular apps already installed. It even comes with an HDMI cable included. It doesn't take long to get up and running. But, what do I not like about it? Well, apart from the pre-installed or recommended apps, it's not that easy to get all the apps you might want through the standard interface. If you have the Play Store installed, you can browse the limited selections there. There are more apps available than show on the Google Play Store app on the Android TV device. While they do show many of the biggest, that's not always the case. For instance, Spotify doesn't show when browsing on the device, though Pandora does. A slightly better option is to use the voice search to search for apps. For example, to install the Boomerang app, I couldn't find it when I searched for "Boomerang," but did when I searched for "Boomerang app." Another option is to search for apps from the Google Play Store Website. As with the voice search, simply searching for the app name might not be good enough. I had to search for "Boomerang for Android TV" to find that app. One major omission, at least in my opinion, is that DirecTV Now isn't supported on Android TV. Philo isn't either. Sling TV is, Hulu with Live TV is, and YouTube TV is, so it has most of the major live streaming services. If you've used Chromecast, it may be useful to know that Android TV devices have Chromecast built in. You can stream from your computer, your Android phone or tablet, or iOS apps that support Chromecast. If you're looking for a good streaming device, particularly an Android TV device, the Mi Box is a good choice. It's not my top choice, because of the limited number of apps, but it's a good little device.